For the third consecutive year the European Cable Industry will celebrate its best innovations and most promising talent at the Cable Congress, which takes place in Amsterdam from March 12th till March 14th. The winners will be announced during the Award Ceremony at the 2014 Cable Congress. The Cable Europe Awards recognize significant contributions that help create a flourishing future for the Cable industry and its partners in Europe. Our industry thrives on innovation to offer the best solutions and services for our customers. Innovation is what makes our industry flourish and that innovation deserves to be put in the spotlight for all to see, share and be inspired by. So submit your innovative projects from 2013 to the competition and come celebrate the successes of the European Cable Industry at the Cable Congress. There is no great cable industry without great people working in it. The Fellow Award puts those great people that go the extra mile to make the impossible happen in the spotlight. Who are the rising starts of the European Cable Industry? Who went all the way to find the right solutions for their customer? Who created the right partnerships to create that win-win? Nominate your favorite candidate for the 2014 Fellow Award and maybe he or she will be on stage at the Cable Congress to accept the Fellow Award. We look very forward to hearing from you. Anybody connected to the European cable industry is invited to put forward innovation projects & fellow candidates. – Nominees for the Cable Europe Innovation Award can only be projects from a European cable company, which can include joints projects with a partner vendor, content provider, consultant, etc. – Nominees for the Cable Europe Fellow Awards can only be individuals from a European cable company. Nominees are not part of the C-level management team of the company. Based on entries received, the jury of Cable Europe will put forward a list of three nominees for each award. Nominees will be informed three week prior to Cable Congress. The Winner of the Innovation Award will be chosen by the attendees of the Cable Congress via an interactive voting. The Winner of the Fellow Award will be chosen by the Executive Committee of Cable Europe. December is here – we are officially in the run-up for the holiday season. Before the holiday rush reaches fever pitch, now would be a good time to secure your delegate experience at Cable Congress 2014. Taking place on 12-14 March at RAI in Amsterdam, the event brings together top executives from the cable, technology, content and new media industries. Register here. Cable Congress offers an extensive programme featuring the most influential and visionary leaders from the industry. With more than 80 speakers coming from Europe, the US and Asia, this conference provides international insight on the latest developments in the fields of strategy, investments, technology, marketing, content and regulation. Robin Bienenstock, Senior Sell-Side Equity Research Analyst, Sanford C. Bernstein & Co.
Stay tuned for the full detail of the presentations and the extensive top level speaker list. In the meantime, visit www.cablecongress.com for event information, join the our LinkedIn Group, and follow the event Blog. Service providers and enterprises are continually being challenged to transport more data while at the same time reduce costs. After all, it is in the metro that optical networking’s most critical, bandwidth-intensive applications – residential broadband, business Ethernet, mobile backhaul and data-center connectivity – all converge. 100G technology has been elected to address the challenge of transporting enormous amounts of data and add scalability to optical networks. Clearly, 100G has rapidly matured. The time between early hero experiments and commercial product realization has been remarkably short. One factor accelerating the 100G development cycle has been early consensus across the industry on how 100G should be tackled. The OIF’s recommendation of DP-QPSK modulation for long haul systems allowed the component industry to focus its efforts into one direction. In addition, the IEEE released standards for client interfaces up to 40km, including a four-lane approach with 25G per serial channel. No standards group, however, seemed to pay much attention to the metro segment, which comprises distances between 25km and 500km. 100G coherent solutions have great spectral efficiency, but they score very poorly in terms of space and power consumption, especially when compared to the 10x10G channels they seek to replace. This is not a temporary design flaw of early implementations but rather inherent to the technology itself. Coherent receiver technology is complex, including a lot of signal processing, which consumes significant amounts of power and generates a lot of heat. Secondly, the cost aspect: 100G coherent solutions are certainly well on their way to move downward on the cost curve – but so are existing 10G solutions. As always, the industry is aiming at a moving target. While volumes for 100G coherent technology are going up helping to drive the cost curve down, the gap to 10x10G solutions will remain significant for quite some time. These drivers illuminated the market opportunity for lower-cost, direct detection 100G designs for the metro, and, indeed, solutions have quickly emerged. Direct detection 100G solutions are cost competitive with established 10x10G systems from day one. ADVA Optical Networking’s efficient 100G Metro solution is the most effective way to simply transport data traffic in metro and enterprise applications today. It is fully integrated into the FSP 3000 platform and utilizes four DWDM wavelengths with 28Gbit/s capacity per wavelength to support data transmission over distances up to 500km. Its state-of-the-art design offers powerful forward error correction options supporting effective link design. Figure 1 illustrates how the FSP 3000 100G Metro solution optimizes 100G transmission over typical metro and regional network distances. Lowest cost-per-bit transmission is achieved through deployment of non-coherent direct detection. Without the use of inline amplification or passive dispersion compensation, 125km error-free performance is achieved. 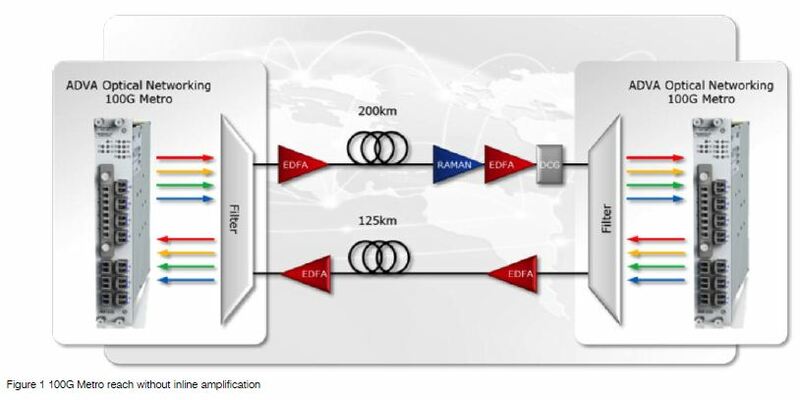 Without passive dispersion compensation, network operators can utilize lower cost and single-stage EDFA amplification at the terminal end points. When applying dual-stage Raman/EDFA amplifiers, the achievable single-span reach is extended to 200km, enough reach for most metro application. Optical networking is not a one-size-fits-all, commodity technology space. ADVA Optical Networking’s 100G Metro is the most effective way to simply transport data in metro and enterprise applications. Its compact design provides industry-leading space efficiency, its low power consumption and minimum heat dissipation saves operational cost and its ultra-low latency design makes it ideal for high-frequency trading applications. 100G Metro: The lowest costper-bit 100G transport available today. Figure 2 shows ADVA Optical Networking’s implementation of a 100G Metro multiplex-transponder for the FSP 3000 scalable optical transport solution. While enabling maximum 100G efficiency over metro distances, a complementary coherent 100G implementation provides scalability also for long distances.